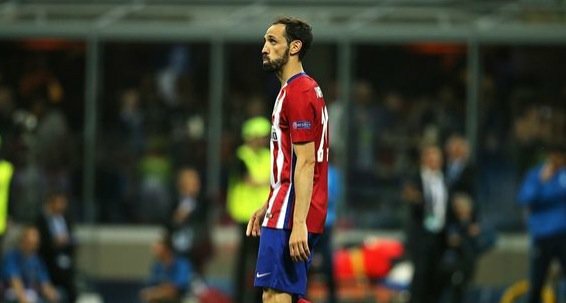 Escobar was assassinated for scoring own goals, David Beckham was issued death threats for a penalty miss but Atletico Madrid fans pulled off a thing that would ever be remembered in the heart of Juanfran after they showed him total support despite is decisive penalty miss in the Champions League final against Real Madrid. Atleti were close to lifting their first ever UCL title in 2014 but conceded an equalizer with seconds to go and went to to lose 4-1 after leading 1-0 for 92.5 minutes. The Rojiblancos came as close to winning it again a week ago, against the same opponent but lost out after Juanfran missed his spot kick, firing against the upright. Cristiano Ronaldo sealed the win with his final kick. That penalty miss meant Atletico Madrid have lost in all four finals they’ve been to in their history in the European Cup/Champions League. After the game, Juanfran went to the Atleti fans area to apologize for his miss and he was forgiven instantly, greeted with a standing ovation and a loud cheer by the fans, a beautiful sight. “Hello Atleticos. I have asked the club to address all of you with this letter to tell you everything I feel. I will never forget your displays of affection when I came to ask for your forgiveness. Seeing my tears reflected in the faces of the thousands of Atleticos that packed that end of the stadium helped me cope with the tremendous sadness I felt in those hard times. As well as the support of my teammates, coaches, and all the people that makes this big family. “I also want to thank you for always believing in us and, above all, for proving that being an Atletico is something very special, different, and that our heart beats stronger than any other. “Two years ago, I told you that we would return to a final, now, I tell you that Gabi, our captain, will lift the Champions League sooner or later, and we will celebrate it all together in Neptuno [the statue in Madrid]. No doubt this letter went into the hearts of Atletico Madrid fans and their belief in the team will keep on burning. Also, it is very clear that the fans approach to the situation will do a lot of good to Juanfran who will regain his confidence back, there is nothing like the support of the fans for a player, kudos to Atletico Madrid for showing that football is a beautiful game..